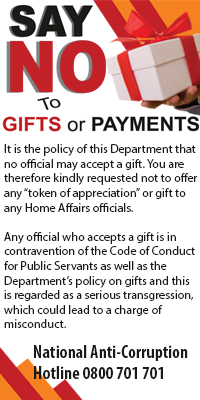 When it is a ‘gift’… unless you want to call a spade a spade, in which case it is the same thing. Which brings us to the story of Home Affairs data capturer Ms Mathato Mokhele, who was fired in 2007 for accepting a packet of Marie biscuits as a ‘gift,’ and has since being pursuing legal avenues in an attempt to have her dismissal overturned… and been soundly rebuffed at every step of the way. The gory details are here: A bribe is a bribe….